Anne Charlotte Leffler was one of the pre-eminent authors of modernism’s breakthrough. She was known for the socially critical dramas and short stories, which focused largely on gender, power, eroticism and the right to own property. Anne Charlotte Leffler was born in 1849 and grew up in an intellectual environment. Her father, Olof Leffler, was the headmaster at Katarina elementary school in Stockholm. Her mother, Gustava, was a well-read, linguistically-talented and strong-willed daughter of a priest. Of the three boys in the family two became professors and one an engineer. Her mother and brother Gösta supported Anne Charlotte Leffler’s literary ambitions throughout her life. However, they also provided criticism and censorship. Anne Charlotte Leffler attended the serious and conventional Wallin school. There the natural gentleness and humility of women was not questioned. Learned women were seen as an abomination. Thus, for a few years, Anne Charlotte Leffler gained superficial insights into numerous subjects, but there was never any talk of her continuing her education past the age of fifteen. Nonetheless Anne Charlotte Leffler dreamt of gaining further skills and of writing, but these dreams led to feelings of guilt and shame as they conflicted with the sort of femininity typical of the era, which the school had sought to imprint on her. In 1872, when she was 23 years old, Anne Charlotte Leffler married Gustaf Edgren, a lawyer. This meant that she was provided for and gained a social position. Her husband made it clear from the outset, however, that he had no time for her ambitions to be an author. She did not let this deter her, shortly after getting married, from making an anonymous debut as a playwright with Skådespelerskan, a light-hearted comedy with harsh undertones. Here she highlighted the conflict between a woman’s artistry and the conventional female role, which became a recurring theme in her writing. Her marriage to Gustaf Edgren lasted 16 years. The relationship was cool, friendly and childless, all of which enabled Anne Charlotte Leffler to develop her writing skills. Having used a variety of pseudonyms like Carlot, Otto and “A.Ch.E-n”, she began to use her own name in the early 1880s. At the time Anne Charlotte Leffler was at the core of new Swedish literature. A contemporary critic named her “the literary lioness of the day”. Younger authors looked up to her and her fellow author August Strindberg as “Mama and Papa”. Authors and critics gathered at her house and formed the discussion group Svältringen (the starvation circle). Anne Charlotte Leffler also presented Danish readers with an anthology of contemporary Swedish literature. In 1887 Anne Charlotte Leffler travelled to Italy with her oldest brother, the mathematician Gösta Mittag Leffler. In Naples they met Pasquale del Pezzo, a mathematician and duke, and he became the great love of Anne Charlotte Leffler’s life. After divorcing Gustaf Edgren she married del Pezzo and settled in Naples. Very soon a social circle developed around the Swedish author, which included Benedetto Croce. An international career was beckoning. Anne Charlotte Leffler gave birth to a son in June 1892 but already the following October she died suddenly from a peritoneal infection. As a playwright Anne Charlotte Leffler was largely inspired by Björnstierne Björnson and Henrik Ibsen. She had indirectly adopted a technique then being developed in French theatre by the likes of Eugène Scribe, Alexandre Duma and Émile Augier. As regards the subject matter of her work she followed Georg Brande’s encouragement that literature should discuss current societal issues. She took material from her own life and the reality she saw around her. Elfvan, performed by Nya teatern in 1880, was a spin-off of her story Runa and is thematically reminiscent of Skådespelerskan. The central character, a woman, feels trapped in her marriage and longs for freedom. However, the character does not break free – like Nora in Ett dockhem. That year it was Ibsen’s and not Anna Charlotte Leffler’s marital drama which became the main talking point. Sanna kvinnor, 1883, is a sharper and more disciplined play. Anne Charlotte Leffler uses humour and psychological clarity to pose questions on the fundamental essence of woman and on married women’s rights to property. Ellen Key was convinced that the play had a significant impact on public opinion. While travelling to Germany and England Anne Charlotte Leffler investigated all the radical movements she came across, including socialism. Her most political play, Hur man gör godt, considers issues such as poverty, class differences, charity and workers’ rights to get organised. The play resounded in particular with the socialist leader August Palm. 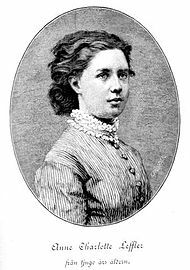 In terms of prose writing, Anne Charlotte Leffler made her debut using her own name in 1892 with a collection of short stories called Ur lifvet. Here she adopted Émile Zola’s thesis that literature should depict a corner of reality as seen through a particular gaze. Anne Charlotte Leffler’s gaze was sharp, ironic and questioning. She was also empathic and cautious enough that she did not scare off her bourgeois readership. Her short story “En bal i societeten” is a masterpiece. The collection of stories became a great success. In Ur lifvet, samling 2 she is bolder. The short story “Aurore Bunge” portrays the love affair of a young high society lady with a lighthouse keeper. This is a theme that anticipated D.H. Lawrence’s Lady Chatterley’s Lover. It also upset the critic Esselde (Sophie Adlersparre), who was on the conservative side of the time’s morality debates. Anne Charlotte Leffler’s love affair with the Danish pedagogue Adam Hauch was reflected in En sommarsaga, 1886. Her portrayal of love between a female artist and a male Norwegian schoolteacher is fresh and unconventional. She was most personal and gripping in the second part of Kvinnlighet och erotik, which she wrote after meeting Pasquale del Pezo. Here she is openly sensual whilst also revealing her own doubts and difficulties in the search for a rich and equal relationship. In Naples Anne Charlotte Leffler, now duchess of Cajanello, continued to write. In 1892 her biography of her close friend Sonja Kovalevsky was published. The biography presents a vibrant impression of the highly talented mathematician but also of the author herself. After Anne Charlotte Leffler’s death two volumes were released called Efterlämnade skrifter. They provide evidence that had she lived longer her writing could have developed further both in Sweden and internationally. Anna Charlotta (Anne Charlotte) Gustava Leffler, www.skbl.se/sv/artikel/AnneCharlotteLeffler, Svenskt kvinnobiografiskt lexikon (article by Monica Lauritzen), retrieved 2019-04-20.